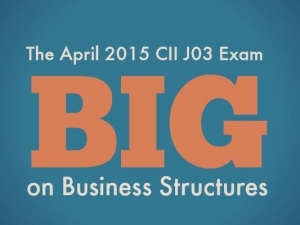 This week we’re looking at the J03 October exam, the tax and legal aspects of business. 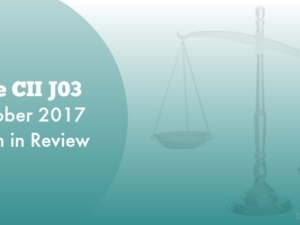 This will be of interest to you if you’re planning to sit J03 in April. Candidates are given two hours to answer 15 short-answer questions, for a total of 130 marks. The paper generally starts with fairly technical questions. This paper started with an explanation needed for the differences between ‘actual’ and ‘apparent’ authority of a partner, with reference to the Partnership Act 1890. Another technical area included the testing of debentures and the differences between a floating charge and a fixed charge debenture. Areas tested in most sessions include bankruptcy, and this time, candidates had to explain how the trustee in bankruptcy would deal with a family home as part of bankruptcy proceedings. This was for 9 marks, so a fair level of detail was needed. Also for 9 marks, an explanation of VAT for a sole trader was required and the consequences of them being VAT registered. Ratios often appear in this paper, and this was one of them – the working capital ratio, the quick ratio and then a comment was needed on the financial stability of the company, based on the answers reached. Anyone who painstakingly revised all the formulas would have been pleased they were put to good use. Question 6 included another sole trader; this time, candidates had to explain how losses in the early years of starting a business can be mitigated against income from previous years. There was also a question on business relief. One chapter that must be challenging to revise is the chapter on employment law; many of the candidates won’t necessarily be dealing with large employers so won’t bump into some of the detail in the chapter very often. This time though, the questions were kind; there were only 4 marks on offer for the Statutory Sick Pay criteria and then 5 examples of flexible working were needed. Next we had a calculation of income from UK shares and from UK Fixed Interest Securities received by a higher rate taxpaying employee. One catch here was that the fixed interest income would need to have been grossed up and we suspect many candidates would have forgotten to do this. As long as the various allowances were not forgotten about, candidates should have picked up most of the marks, even if they had forgotten to gross up. The next area tested was how beneficial loans are treated and we had two examples of employees who had been granted such loans. Into the home stretch and next came key person insurance and the benefits and drawbacks of the two main methods for working out the sum assured. Candidates entering a J03 exam must be prepared for this type of question, so we hope good marks were scored. We then had a question on the CGT implications between spouses for 7 marks and the main features of buy and sell agreements and cross option agreements (and again a candidate should not enter the exam room without these areas having been carefully studied and revised). The last two questions tested quite specific knowledge: firstly on salary sacrifice, including the benefits and drawbacks and a 9-mark calculation, which candidates may have struggled with. The final question tested recycling a PCLS, and although the explanation is probably the easy bit, the second part wanted to know the HRMC rules, which are quite specific knowledge and may have caught some candidates by surprise. 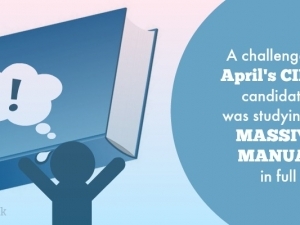 Anyone studying for the April paper needs to have in place by now a thorough revision timetable, but using the past papers will help enormously in seeing the types of areas that are tested time and time again and the style of questioning. 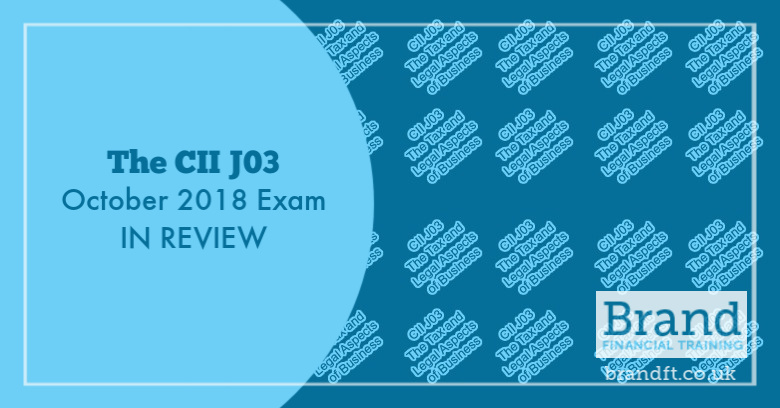 If you’re studying for your CII J03 exam, and you’re feeling anxious about exam day, grab our free taster to try out one of Brand Financial Training’s mock exam papers for yourself. 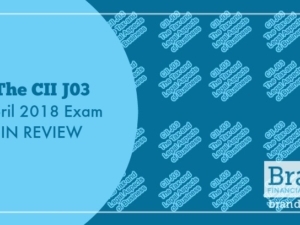 Click the link to download the J03 mock exam taster now!